Whether you’re an astrologist or just think the whole psychic thing is nonsensical, it’s hard to deny that psychics are good entertainment. 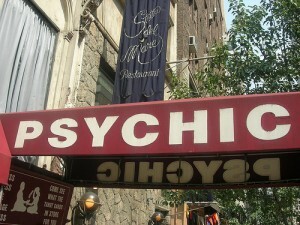 If in fact you are in the mood for a little spiritual twist (or a laugh), Hippie Gypsy Cafe , located on Shattuck Avenue, will be hosting a Tarot and Telepathy display tonight from 6:30-8:30 p.m. Owner Mary Dirks describes her cafe as, “relaxed and cheerful,” and is looking forward to tonight’s performer. ”He’s an intuitionist named Courtney Kolb and will be doing tarot readings, aurora readings and numerology,” said Dirks. If you’re not fully tuned into the psychic world, tarot readings come from a deck of 22 cards and make predictions about a person’s life based on the picture of the selected card. By contrast, Aurora readings are supposed to provide healing by connecting an individual to some sort of spirit from a higher dimension. Then, there is numerology which analyzes special relationships between numbers to reveal a significant truth about a person. The visiting intuitionist claims to empower people with these readings. Now we have to try it.